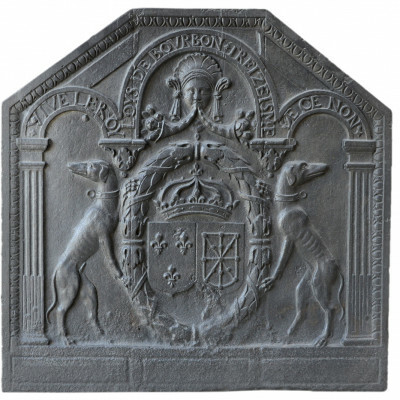 Dating from the early eighteenth century, cast iron fireplace plate. The central coat of arms is surrounded by a crown of foliage, as well as two dogs.Ecu of left: azure with three fleurs-de-lis of gold; Ecu of right: Gules with the chains of Navarre of gold. The whole is placed inside an architecture supported by two lateral pilasters composed of Doric capitals, fluted barrels and rudentés to the third. The vaults of the construction rest on foliated caps, and are engraved with the inscription:"VIVE LE ROY LOYS DE BOURBON TREIZEISME DE CE NON". Under the central vault is a human figure pattern adorned with horns of plenty. This plate is thus with the arms of Louis XIII, on an initial model of the forges of Cousances (Carpentier 179, 481, 483, and 594).